Make lasting moments in the Last Frontier. Alaska is a dream destination for almost everyone, so why not reunite in Anchorage and explore Alaska with the people who matter most in life? You’ll have plenty of time to share old memories and create plenty of new and unforgettable ones as well. Still waiting for the last few folks to arrive? Grab a hearty breakfast and soak in Alaskana at a famous breakfast spot in Spenard. The neighborhood is close to the airport, so scooping up the final arrivals will be a breeze! Ready to for another Alaska experience, but need to stick close to the airport? Check out the 900 Alaska Native artifacts, gold and fine art at the Alaska Heritage Museum at Wells Fargo in midtown. The gang’s all here! Having trouble fitting everyone in the photo? Pick a panoramic backdrop. The scenic overlook at Glen Alps trailhead on Flattop Mountain offers sweeping views of the Anchorage skyline, surrounding mountains and the waters of Cook Inlet; shuttles available. Closer to downtown, Point Woronzoff features a shot of the city from the west. It’s located along the the 11-mile Tony Knowles Coastal Trail, which makes it convenient for an afternoon stroll or bike ride. Head to Midtown Anchorage for some famous local pizza. Everyone in your crew will find a topping to enjoy; try a Kodiak Ranch or Solstice pizza. Big group? Order a big pie! There’s plenty to wash down all that pizza too. Try a Prince William&apos;s Porter or Polar Pale Ale brewed by the pizzeria. The root beer and cream sodas are craft-brewed too! It’s going to be a big day, so fill up on flapjacks or a big ole’ omelet and watch sea planes take off on water at a restaurant located on the shores of Lake Hood – the world’s busiest floatplane base. Then check out the Alaska Aviation Museum’s collection of vintage planes. The museum’s restoration projects return historic aircraft to the skies over Alaska. Take to the skies. Book a flightseeing tour from Lake Hood and fill your camera with stunning shots. Larger floatplanes like de Havilland Otters can take up to ten people at a time, and there’s no fighting over window seats; everyone has a spot with amazing views of Alaska’s glaciers and peaks. 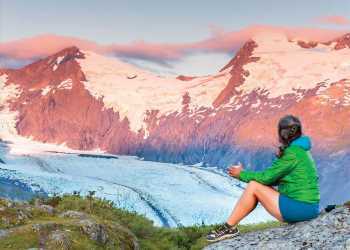 If everyone’s up for it, you can book trip that touches down on a glacier or a remote lake and hike in wild Alaska. You’ll end the day back in town, but you can still swap stories around a campfire. Fire up the barbecue in one of Anchorage’s parks. Picnic under an outdoor pavilion, or reserve the chalet in Kincaid Park. Either way, there’s plenty of room to roam. So toss the ball, take a walk or watch the kids clamber on the playground. Anchorage is home to hundreds of resident moose, so don’t be surprised if you party isn’t the only one holding a buffet in the park! Climb aboard the Alaska Railroad for the ride to Seward. The three-hour ride pulls through the city, along the waters of Turnagain Arm, and into mountains. Spot wildlife, pristine lakes and glaciers from the train. Spacious dome cars and viewing decks give the best possible views, and are the perfect spot to sip a cup of coffee or tea and catch up. Weigh anchor on a glacier and wildlife cruise in Kenai Fjords National Park. Rangers and crewmembers have a nearly encyclopedic knowledge of the area’s geology, wildlife and World War II history. From the deck, you’ll be able to spot whales, sea otters, eagles, sea lions and puffins, just to name a few. Keep an eye on the shoreline, you&apos;ll see many glaciers and maybe a bear. Hop the bus for the return trip to Anchorage. Rail and glacier cruise combos are also available for nearby Prince William Sound. Throw a big farewell bash at a South Anchorage restaurant. A full banquet will leave plenty for seconds, or even thirds. The entertainment’s taken care of too. Hear gold rush tall tales and Alaska ballads with a revue of the pioneer days hosted by a salty ol’ miner. If it’s time to head home, luggage storage and airport transfers are available from the restaurant itself.